Per S.B. 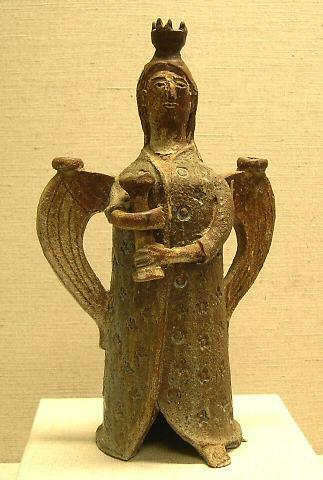 - Angel Candelabrum; hand built of buff stoneware; blue glaze on robe, white glaze stripe on back of robe; brown glaze on hair; brown glaze on hair. Robe is marked with circles and stars. A bare foot peeks out of the bottom of the robe. Figure is made with holders for candles. One is placed so that the figure appears to be carrying a candle. Two others appear on the upper tips of the figures's wings. According to Forrest Merril, an avid Wildenhain collector, Wildenhain made pieces like this during her first ten years in California. They may be related to Wildenhain's Bauhaus days in Germany, when the community made dough figures at holiday time.